? 100% handmade from start to finish. All hand stamped work will look similar to this, but due to the nature of stamping, will be unique to your pair.? 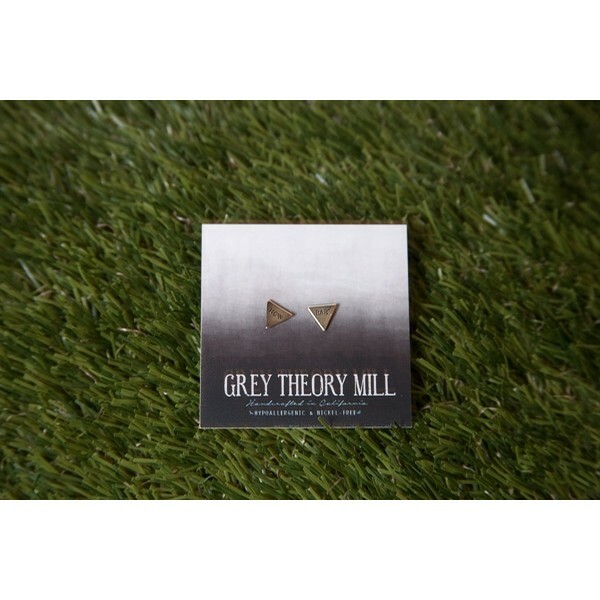 ?All Grey Theory Mill earrings are made with Hypoallergenic, Surgical Grade A, Titanium Earring Wire. Titanium has no traces of nickel and is the premier metal for sensitive ears, which is why this metal is used for surgical instruments.? ?Earrings are NOT waterproof. Please remove earrings before swimming & bathing as water temperature and chlorine could compromise the bond between earring piece and post.?? ?Raw brass will naturally patina in color over time. If you prefer a bright gold-brass color you can rub them with a jewelry polishing cloth or brighten with lemon juice.